April 2018 – Welcome to Wyandotte Daily! Gov. Jeff Colyer has what he wanted — a bill to make sure schools get a funding increase of more than half a billion dollars is headed to his desk. But senators who took the final vote Monday weren’t too happy about what they passed. Across party lines, some were already predicting an emergency legislative session in the future. Colyer praised lawmakers for finishing a second school finance bill this session to correct an $80 million error in the first. “I look forward to signing this,” he said in a statement. The question now is whether the spending plan will pass muster with the Kansas Supreme Court. The justices have ruled that the state must prove it’s doing enough to help tens of thousands of kids struggling with math and reading. “Vote for the bill and let the court play its role,” he said. So why wouldn’t the court sign off on the bill? Lawyers for the school districts suing the state think K-12 education needs more than the $530 million infusion to make any significant dent in the number of students who falling behind in school. Some lawmakers suspect the court will agree. Others worry that the legislation they passed doesn’t do enough to create change in schools, to better serve those underachieving kids. Some pointed to a provision in the bill designed to make the court view more than half a billion dollars that schools collect by taxing homes and other local property as state funding. Members of both parties were doubtful the added money would make a seven-year-old lawsuit disappear. The average taxpayer doesn’t care how the state labels various taxes, Fitzgerald said. They’re all still taxes. As for the Supreme Court, he said, nothing short of changing the state constitution will put an end to the series of rulings that have found schools underfunded. A vote on amending the constitution to curb school finance lawsuits doesn’t look likely by the end of this year’s session on Friday. Kansas City Kansas Community College’s young softball team battled right down to the final pitch in Region VI playoff action Saturday. A bloop single with two out in the bottom of seventh inning scored the winning run in Johnson County’s 6-5 win that ended the Lady Blue Devils’ season. The Lady Cavaliers had won the opener in the best-of-three series 8-0 in the games played at JCCC. The Cavaliers took a 5-0 lead after three innings of the second game only to have the Blue Devils score three times in the third and single runs in the fourth and fifth for a 5-5 tie. Freshman Kaylee Arnzen led the comeback, driving in two runs with a double and single. Kali Jacobson also had two hits while Natalie Cowan and Jennifer Mullins had RBI singles. Sophomore Shannon Greene took the loss, allowing 13 hits and five earned runs. She struck out two and walked one. Halle Brin (13-8) got the wins in both games for Johnson County. Brin gave up only a single to Shelby Espy and struck out nine in the 5-inning 8-0 opener and then allowed two hits and one run in 2 2/3 innings of relief in the second game. JCCC took advantage of seven KCKCC errors to score six unearned runs in the first game. Lansing freshman Katelyn Kittrell allowed eight hits and walked one. The Blue Devils finished the season 12-26 overall and 4-20 in Jayhawk Conference play. 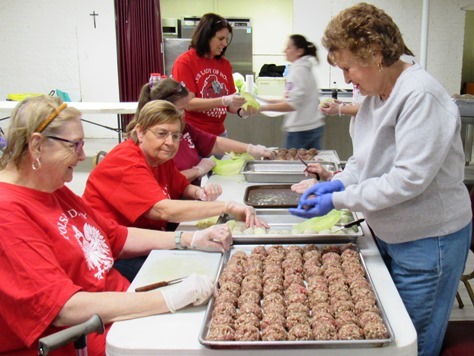 Those who are looking for authentic Polish cooking such as golambki, Polish sausage, pierogi, kielbasa, kolacki and powitica need look no further than the 34th annual Polski Day celebration. This event is from 11 a.m. to 6 p.m. Saturday, May 5, at All Saints Catholic parish, 8th and Vermont, Kansas City, Kansas. Polish food, music and activities are part of the celebration. It is a fundraiser for All Saints parish, formerly St. Joseph-St. Benedict Church. It was on May 3, 1791, that the Polish Constitution of Freedom was signed, leading to the annual celebration on the first Saturday of May. 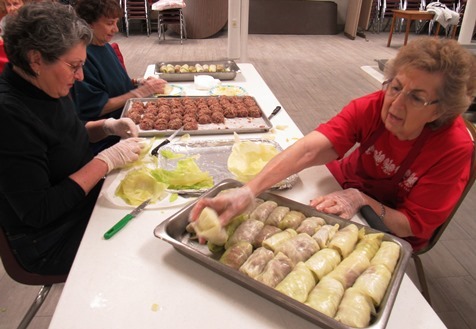 Volunteers, including some mother-and-daughter pairs, spent one recent April Saturday at the All Saints church basement making an estimated 1,200 cabbage rolls (golambki) that will be frozen until Polski Day. 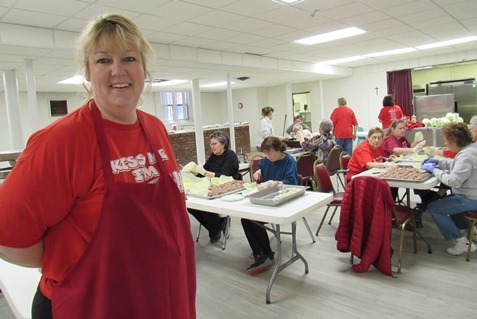 Another day in April was spent making about 3,600 Polish cookies for the dinner, scheduled 11 a.m. to 6 p.m. May 5 at All Saints Church basement. There will be a raffle for a quilt made by a parishioner. Polski Day will begin with a parade at 11 a.m. May 5 at 12th and Central, east on Central to 8th Street, and then to Vermont, ending at All Saints Church. An important part of Polski Day will be a Polka Mass scheduled at 4 p.m. May 5 at All Saints. Besides the authentic ethnic food, there will be music at the festival by Jim Baric, accordionist; Brian McCarty, accordionist; the Brian McCarty Polka Band; and the Ed Grisnik Polka Band. Cathy Kolenda-Smith, Polski Day Committee member, said 100 percent of the funds raised will go toward All Saints parish. She said funds from Polski Day recently went to put a new floor in the parish hall, and also, the ceiling was replaced, with new lights. The restrooms are also being remodeled at the church hall, and three offices were added in the church hall, she added. Very noticeable at the church currently is the demolition of the former school building on the property. “Originally we were going to restore it, and then we had a water main break in there, and it destroyed a lot,” Kolenda-Smith said. The insurance wouldn’t cover nearly half of it, and the archdiocese decided it was more of a hazard than it would be to fix it, she said. The school building was demolished within the last month. The school area will be turned into a parking lot, with future plans to build a parish center there, Kolenda-Smith said. The parish center might be a long-term project. Some of the funds raised at Polski Day will probably go toward the new parish center, she said, as well as toward whatever projects at the church need funds. The family-oriented Polski Day is open to everyone in the community and is planned as a way to unite the community. The event also includes an online fundraising auction including gift certificates and other items at https://polskiday.com. For more information about Polski Day, visit https://polskiday.com/. A school building at All Saints Catholic Church, formerly St. Joseph’s, near 8th and Vermont, Kansas City, Kansas, was demolished recently. Some of the funds raised by Polski Day on May 5 may go toward building a new parish center on this site.